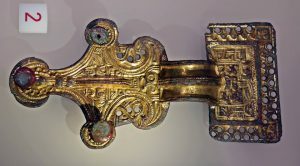 An exploration of eye imagery on weapons, and ornaments mainly from the 6th and 7th centuries in Northern Europe. Part 1 of 2. The title of this paper comes from a conversation I had with Neil Price whilst discussing our paper, “An Eye for Odin? 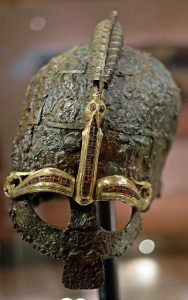 Divine Role-Playing in the Age of Sutton Hoo”, we briefly discussed the idea of further investigation into the eyes of deities and thought it may be interesting to see whether their colour(s) could be discerned, which is partly the purpose of this paper. Figure 1. 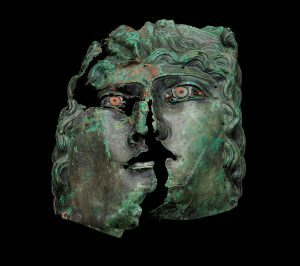 The Roman cavalry face-mask from Hellvi, Gotland, Sweden. Photograph courtesy of Johan Norderang, Gotland Museum. Figure 2. B1 from the Sutton Hoo Stone, England. While the right eye is convex like all the eyes on the other seven faces on the Stone, the left eye has been carefully chiselled away. 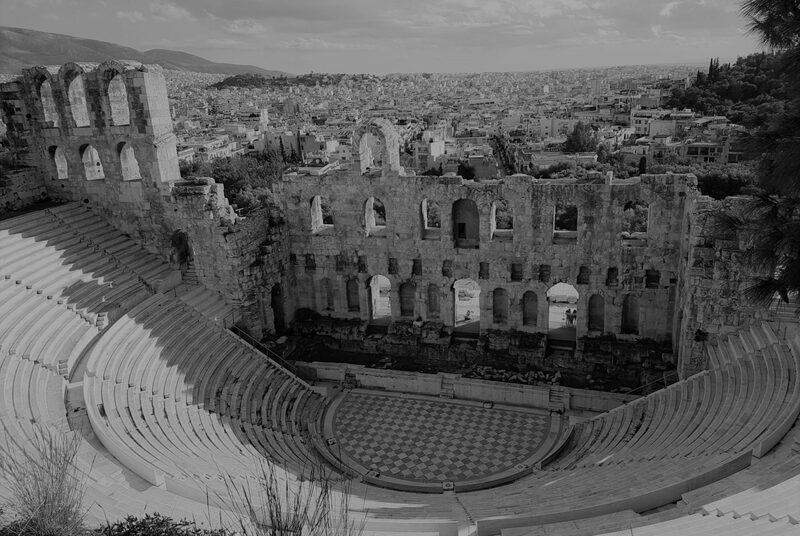 Photograph courtesy of Hannah Simons and the Trustees of the British Museum. Figure 3. 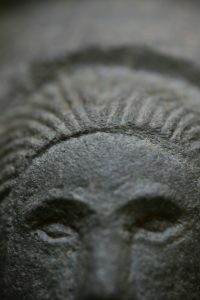 The eyes of the beast head’s terminal on the front of the helmet from grave 7 at Valsgärde, Sweden. Photograph courtesy of Matt Bunker. Taken at the Gustavianum. An eyebrow ocular separated from the rest of the helmet has been found near Roskilde (Gevninge), Denmark (Larsson, 2007. 20 and Christensen, 1999) and another eyebrow was found close to the area where once stood the cult house at Uppåkra (Helgesson, 2004. 231). (figures 4 and 5) We think that it is likely that the eyebrows were removed from helmets during a ceremony commemorating the story of Odin’s eye. Perhaps the eyebrow was then replaced and the helmet continued to be worn? 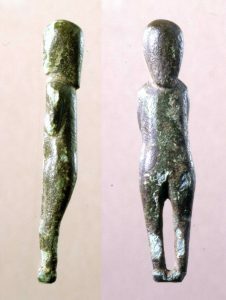 The find at Uppåkra of a ‘horned man’ with an eye struck out (Hårdh, 1998 118) seems to reinforce the importance of the story in this part of Sweden. 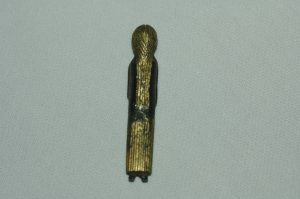 (figure 6) The latter find is one of several such figures now known to have had an altered eye, some dating from the Viking period. Figure 4. The helmet ocular from Gevninge, near Roskilde, Denmark. Courtesy Tom Christensen. Photo: Courtesy Matt Bunker. Taken at Roskilde Museum. Figure 5. 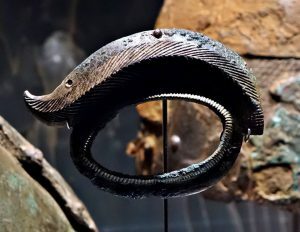 The helmet eyebrow from Uppåkra, southern Sweden. Photograph courtesy of Matt Bunker and Lund Museum. Figure 6. A horned man from the ‘cult’ complex at Uppåkra. Note the altered eye. Photograph courtesy of Matt Bunker and Lund Museum. Similar figures without eyes removed are found in England, Scandinavia and the Continent. 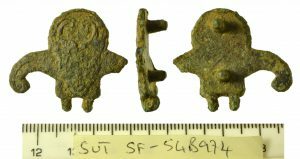 One such is the pin found in a female grave, Buckland Dover grave 161, that clearly indicate that the ‘horns’ were part of a head dress and not a helmet (Evison, 1987. 84, 251, 334 and 397). (figure 7) and two recent detector finds from Denmark also show that the horns were strapped to the head of a man. (figure 8) Many of the surviving figures have had parts of their terminals broken off, but when present they usually, have been found to end in bird’s heads or a bird’s beaks. Odin, of course, in the later stories was reported to have two ravens, Huginn and Muninn, which flew around the World and reported the news back to him (Simek, 1993. 164 referring to Gylfaginning 37). Whilst some of these figures would appear to represent images of men performing a dance or ritual that must have been important over a wide area, some may have been portrayals of a deity, probably Woden, himself (Arent, 1969. 137 to 138 and Gunnell, 1995. 66 to 71). Figure 7. Another horned man, this time from grave 161, Buckland Dover, England. This figure does not have an altered eye, but clearly show that the ‘horns’ are part of a headdress. In this drawing the left-hand horn, which is broken in the original, has been restored. This figure does not have an altered eye, but clearly show that the ‘horns’ are part of a headdress. Drawn by Wayne Letting. Figure 8. 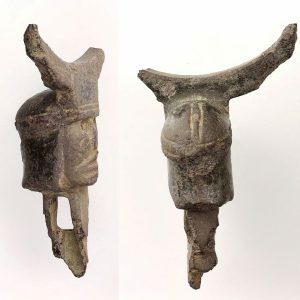 One of the two recent Danish detector finds of a horned man which shows the headdress was strapped on. 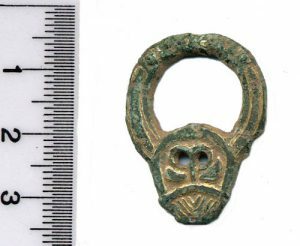 In England and Wales, the Portable Antiquities Scheme (PAS), effectively part of the British Museum, is an organisation where responsible detectorists can report their finds, and often representatives of the PAS are on hand at detectorist rallies to identify and record the finds. 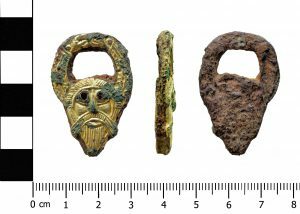 Since its establishment there have been many spectacular discoveries, particularly relating to items that are rarely, if ever, recovered from burials. Some types of horned men are a good example and so far have only been found by detectorists, as far as I am aware. A portrayal, this time of a weaponised, horned man can be seen in BERK-4F2E17 from the county of Berkshire; it closely resembles the warrior/dancers depicted on helmet plates on the Sutton Hoo helmet, the helms from Valsgärde, graves 7 and 8 and one of the plates from Torslund. 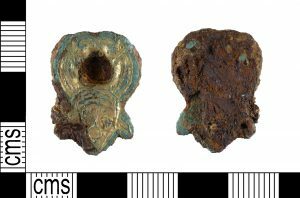 (figure 9) Another find from Hampshire, HAMP-B292C, would appear to be a die for making pressed plates (pressbleche) although somewhat different in form to those found on the helmets (figure 10). Figure 9. Terminal from West Ilsley, Berkshire. BERK-4F2E17 Photograph, courtesy of the PAS. Figure 10. Possible patrix from Crawley, Hampshire, HAMP-B292C2 Photograph, courtesy of the PAS. Figure 11. Horned man with garnet eyes from Ryedale, Yorkshire, YORYM-024D31. Photograph, courtesy of the PAS. 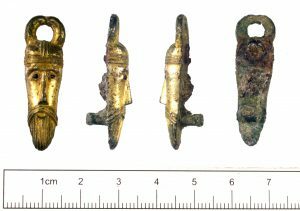 Some horned men images just consist of a male’s head with accompanying horns and birds’ head terminals, YORYM-024D31, an example from Yorkshire has garnet eyes, (figure 11) but SF-54B974 and SF-171680, both from Suffolk, depict a man’s face with the two birds’ heads configured differently, the birds’ beaks are level with the man’s ears but appear to be pointing away from them (figure 12). However, NARC-A9B3E7 (figure 13) has the beaks situated directly at the ears of the man; are we seeing Woden being told what the birds have witnessed in their journeys around the worlds? 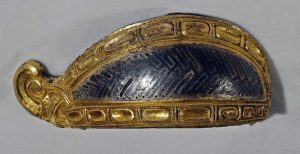 A very similar motif can be seen in this piece of fine work from Cividale, Italy. 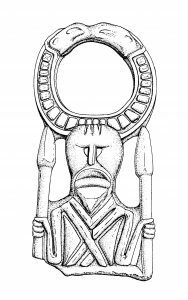 (figure 14) FAHG-8EAAA3, shows the upper body and arms as well as a head, the birds’ heads and integral pellets within the horn design, in some ways reflects similar imagery to that on the horned men (dancers) on the Sutton Hoo helmet, but unlike them, his spears are pointing upwards, how this piece was used is not known (figure 15). Figure 12. 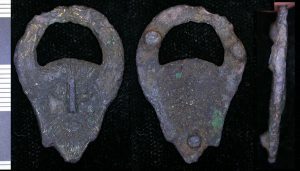 Two items found in Suffolk, SF-54B974 from Sutton, and SF-171680 loacted in Palgrave. Photographs, courtesy of the PAS. Figure 13. NARC-A9B3E7 was found near Titchmarsh, Northamptonshire. Photograph, courtesy of the PAS. Figure 14. 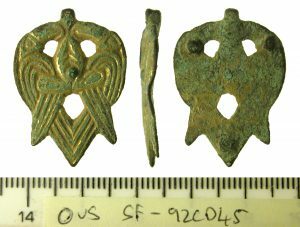 The detail of this fibula shows a man’s head between two birds’ heads. It is from Cividale, Italy. Courtesy of Museo Archeologico Nazionale Cividale. Figure 15. FAHG-8EAAA3 Mount from East Cambridgeshire. Drawing by Lindsay Kerr. A type of horned man composed of just a head but with carefully crafted horns, we have christened WAINEs (Woden Avatars In Numerous Environments) to distinguish them from other forms of horned men. Several of these are so similar in design, that it would appear the makers were using a known pattern, and as far as I know all of the known examples are detector finds. There are currently ten of these recorded and most can be found within the PAS database. 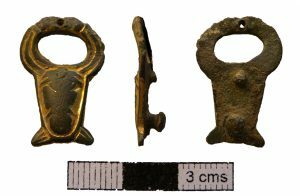 They tend to be made from gilded copper-alloy, some may have been a form of personal jewellery, but most have broken lugs or unusual forms of attachment on the reverse, that indicate that they were fixed to something. I am not aware of any WAINEs from anywhere other than England. Figures 16 to 21 show six examples (figures 16 to 21). 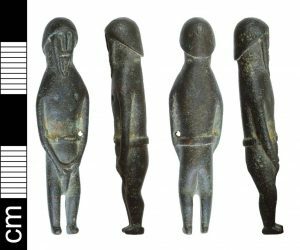 These have all been made very carefully and, together with other figures, would appear to be good evidence for a fairly widespread Woden cult in England during the 6th and 7th centuries if the interpretation is correct. However, it is true that most of the horned male figures have two good eyes which have not been altered in any way but it must be remembered that Woden/Odin originally had two eyes before he gave one up to drink from the Well, and the other attributes of these miniatures, two birds, etc. would seem to indicate a reference to the god. Figure 16. HAMP2432 Soberton, Winchester,Hampshire. Photograph, courtesy of the PAS. Figure 17. LEIC-40DB05 nr Melton, Leicestershire. Photograph, courtesy of the PAS. Figure 18. NMS-F90626 Saxlingham Nethergate, Norfolk. Photograph, courtesy of the PAS. Figure 19. YORYM-FAE4AF Yorkshire. Photograph, courtesy of the PAS. Figure 20. Blakeney, Norfolk. Photograph courtesy of TimeLine Auctions. Figure 21. BERK-DB4E15 Kings Worthy, Winchester, Hampshire. Photograph, courtesy of the PAS. 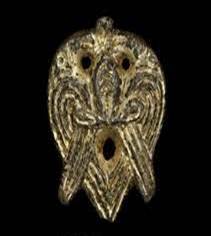 Very similar in design and level of craftsmanship to the WAINEs are two other relatively recent finds which may well make the link to Woden and his two ravens even more compelling. The first is from the PAS archive, SF-92CD45, but the second was sold privately sometime before the discovery of the former. (figures 22 and 23) In each design, there are two birds (ravens?) that form the outline of a man’s head reflecting the general face-shape of most WAINEs. Within the overall composition are a number of holes that are the man’s eyes and mouth; the wings, tail and other ‘feathers’ represent a beard and a long moustache. Whoever made this design was creating a deliberate visual pun, based on the WAINE design and I feel, making overt references to Woden. It is obviously not a normal man dressed up, but I think an image of the god, and again they were gold-plated raising the status of the image. Figure 22. SF-92CD45 was found in Ousden, Suffolk. Photograph, courtesy of the PAS. Figure 23. Object Auctioned by TimeLine Originals. Photograph, courtesy of TimeLine Auctions. Figure 24. Baginton and Offchurch. Photograph of Baginton by John Hines, while that of Offchurch was taken by E. T. Leeds. Reproduced courtesy of the Society of Antiquaries of London. Horned men, or at least horned beings, also appear within the detail of many great square-headed brooches, and possibly other fibula. Sometimes the species identity of the face or head may be ambiguous and the horn terminals are not always of birds’ heads but of other, sometime not distinctly defined animals. 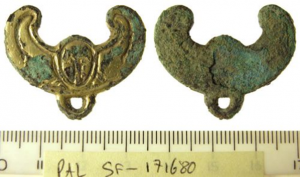 The example from Baginton (left), (figure 24) clearly shows a rather manic man’s face with two beast’s heads on either side which are not birds but possibly horses, whilst the brooch from Offchurch has a smiling but perhaps, more sinister face, again between heads of an animal that is not precisely determined (Hines, 1997. Plate 20). In both cases, horns, if that is what they are, project away from the head. Figure 25. 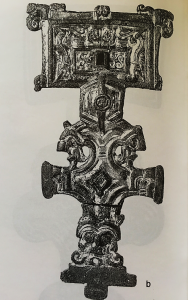 The great square-headed brooch (fibula) from Beckford. Photograph courtesy of Matt Bunker. Figure 26. Lakenheath. Photograph by John Hines, reproduced courtesy of the Society of Antiquaries of London. The square-headed brooch from Beckford (Hines, 1997. Plate 21) (figure 25) repeats a similar design to that from Offchurch, while the specimen from Lakenheath has a moustachioed man’s face with protrusions (horns?) 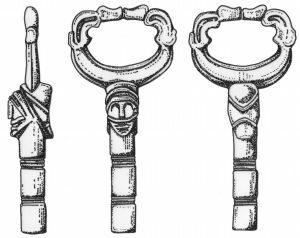 from the top of the head rising, following the shape of the brooch and terminating in fierce animal heads (Hines, 1997. plate 32). 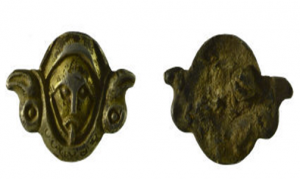 (figure 26) Similar devices appear from other areas than England for example from Fonnås, Norway, (figure 27) and on the brooch from Szolnok Szanda, Hungary (Hines, 1997. plate 102), (figure 28) which shows that ideas were travelling and recognised over a wide geographical area. The central creature’s heads depicted in the latter two examples, again, are rather ambiguous and could be representing an animal or a human. Exactly what each of the men/creatures is illustrating is not possible to say, but they would appear to be reflecting a number of related concepts very likely connected to the world of the supernatural, and in some ways they do have similarities to the horned men. Figure 27. Fonnås, Norway. Photograph courtesy of Matt Bunker. Figure 28. Szolnok Szanda. Photograph by Günther Haseloff, reproduced courtesy of the Society of Antiquaries of London. 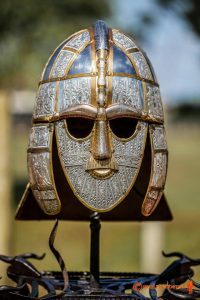 Returning to the Sutton Hoo helmet, there are possibly other portrayals of Woden contained within the design and the most striking is the face on the mask which is an image of transformation: a man’s face that becomes a bird (eagle?) if visualised slightly differently. Together with the ‘serpent’ represented on the crest of the helm they could be a link to the story of Odin obtaining the mead of poetry; he becomes a snake in order to get to the chamber were the mead is kept and becomes an eagle to escape from Suttungr (figures 29 and 30). Figure 29. Face of the reproduction SuttonHoo helmet. Photograph courtesy of Lindsay Kerr. Figure 30. 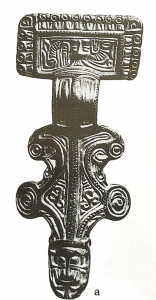 The iron with inlaid silver wire crest (OE walu) from the reproduction Sutton Hoo helmet. Photograph courtesy of Lindsay Kerr. Figure 31. SF-DBD4E8 from near Thetford, Suffolk. Photograph, courtesy of the PAS. 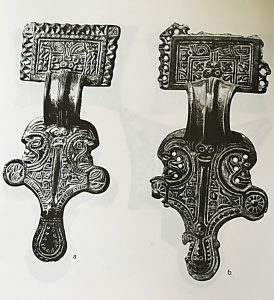 A similar concept is repeated on the male faces that feature on the top section of many square-headed and other brooches (fibula) even more elaborately. The suggestion came from Brundle, although she attributes it to Waugh (1995. 373) (Brundle, 2014. Volume 1, 143 and volume 2 figures 6.1 and 6.3) Most, if not all of the heads have moustaches as well as elaborate ‘tongues’ (figure 32). Figure 32. BH-588FD1 brooch from Sandy, Bedfordshire. Drawing used courtesy of the PAS. 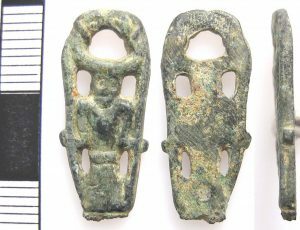 Two square headed brooches from Holdenby and Kempston will serve as final examples here (Hines, 1997. Plate 79). 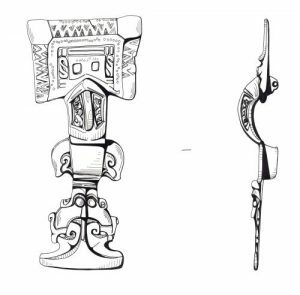 (figure 33) There is, of course, much more going on in the designs included in most of these brooches that we do not have the space to consider in this paper. Figure 33. Holdenby and Kempston. Photographs by John Hines, reproduced courtesy of the Society of Antiquaries of London. In his 2006 paper, Neil Price warns us not to be too ready to attribute godly status to figurines found from the Vendel and Viking periods and to be aware of other possibilities (Price, 2006. 179), so bearing his warnings in mind for the moment we will proceed by looking at some recent detector finds dated to the 5th to 6th centuries from England and see whether they have any possible divine attributes. 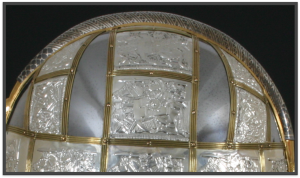 Possibly the most well-known currently in England is the silver example from Carlton Colville. ‘The figure wears golden pants and he has a golden face too. He is quite obviously a man and well-endowed and this is emphasised with selective gilding. He is also a phallus himself (figures 34 to 36). Figure 34. Carlton Colville. Photograph courtesy of the PAS. Figure 35. 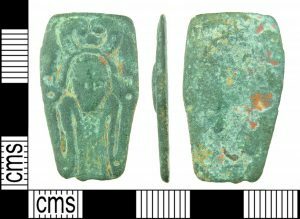 SF-01ACA7, figurine from Friston, Suffolk. There are remnants of gilding in the hollows of the head but most has worn off. Photograph, courtesy of the PAS. Figure 36. NMS D6704B. 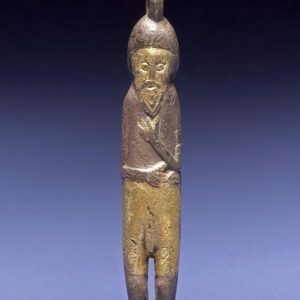 This figurine had at least a gilded belt. Photograph, courtesy of the PAS. The figure has at least two ‘brothers’ with pretty much identical features but with varying arm postures and both of these gentlemen also had some gilding. 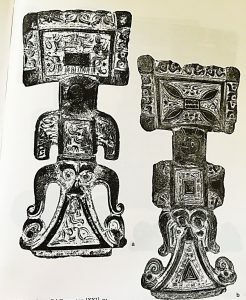 They would seem to be connected with ideas of masculinity and fertility but while the Carlton Colville would seem to be a pendant, there is little indication of how the other two were carried, worn or attached. All of the known specimens of this type have been found in East Anglia, so a fairly limited area and it is possible that they just represent a localised cult and perhaps a deity. 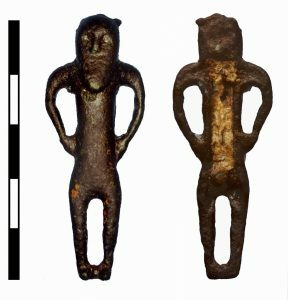 There are equivalent female figurines too, several of which are holding their arms in very similar (protective?) position. 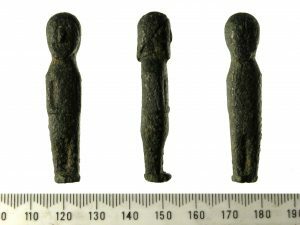 (figure 37 to 40) There also figurines like the one from Caistor, Lincolnshire (NLM-A243C8) that are of indeterminate gender (figure 41). They are not unlike some similar figures from Scandinavia, for instance those from Lunda, Södermanland, Sweden and elsewhere in Scandinavia. Figure 37. 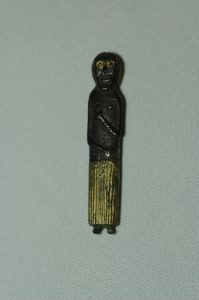 Figurine from Kent. Photograph, courtesy of the PAS. Figure 38. Female figure from Eyke, Suffolk. Photograph, courtesy of the PAS. Figure 39. Halesworth, Suffolk – front. This image, like that from Carlton Colville, has been heavily gilded. Photograph courtesy of TimeLine Auctions. Figure 40. Halesworth – rear. Photograph courtesy of TimeLine Auctions. Figure 41. NLM-A243C8. Caistor, Lincolnshire. A figure of indeterminate gender. Photograph, courtesy of the PAS. 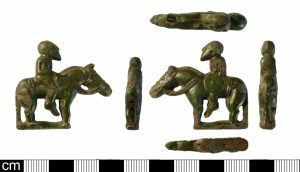 Perhaps the most spectacular figurine found in recent years is this one from Norfolk (NMS-40A7A7) (figure 42). It resembles the horse warriors illustrated on the helmet plates on the Sutton Hoo, Valsgärde 8, Valsgärde 7, Vendel 1 and the Pliezhausen disc. It is armed with a shield and sword, but has a number of small holes which may have held other pieces of equipment, including a spear. Whether or not these portrayals are of deities, a hero or just a depiction of an ideal warrior, as some have speculated, they are impressive, detailed designs carefully executed and surely must have related to something special. It must be added that the inclusion of a small figure seemingly guiding the rider’s spear on some of these helmet images, does seem to link them to the supernatural (see figure 30 as an example). Figure 42. NMS-40A7A7. The horsed warrior. Bradwell, Norfolk. Photograph, courtesy of the PAS. …but most of it is! 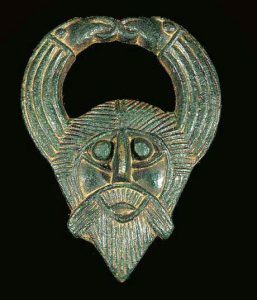 I have used ‘Odin’ when referring to finds from Scandinavia, but ‘Woden’ when discussing 6th and 7th century finds from England and occasionally both together. There is a list of sixteen possible examples of altered eyes and a tentative chronology in Price and Mortimer, 2014. 531. Only a few have been used in this paper. More altered eyes have been found since 2014. 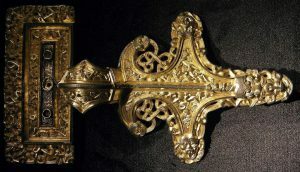 It has been referred to as the Sutton Hoo Whetstone, or the Sutton Hoo Sceptre. See Helmbrecht, 2006, for a useful, if dated, discussion of horned men and related imagery. It is always possible that the finds come from disturbed graves. The distribution of WAINEs is fairly widespread and they have been found in the counties of Yorkshire, Leicestershire, Nottinghamshire, Norfolk, Suffolk and Hampshire. In England, a detector find only has to be reported by law, if it contains 10% or more of silver or gold. Neither of these two items does, however, one was reported to the PAS. 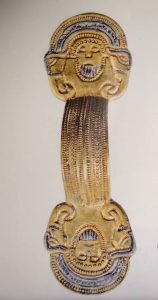 A similar idea is contained within the Sutton Hoo shield, where the fierce bird has a man’s face picked out in garnets and glass on its hip. He is recorded in the PAS archive as are nearly all of the figurines found in figures 35 to 44.However, at the time of writing, something has happened to the available on-line archive and some of the figurines appear to have lost their individual identifications and have been subsumed into the entry for SF-01ACA7. Some have, temporarily I hope, disappeared from the archive; this includes all the female figures and the individual entry for the Carlton Colville. Most of the figurines listed here are extensively discussed in Brundle, 2014. Next PostNext Part 2: What Colour a God’s Eyes?